After an early morning flight to Venice, and complete chaos at the Avis rental desk, we were on the road headed to northern Italy – which, yes, you can reach in an easy couple hour’s drive from Venice. Our windshield wipers were working overtime the entire drive, and we kept refreshing our trifecta of weather apps, in hopes that they would reveal that mother nature would have some change of heart for the day. Not exactly the best start to our Italian Dolomites hiking trip, we thought. But onward we pressed. Finally: a weather window appeared on our Storm weather app: 7pm that night. “Fine,” we reasoned. We would hang out in Misurina, 15 minutes away from the hike we had planned our trip around: the Tre Cime di Lavarado. I’ve never complained about lingering in small town Italy for 6 hours, eating pizza and sipping on Italian wines.... first world problems, right? A sunset hike instead; no problem! We idled in a parking lot for an hour, trying to decide which restaurant would best suit our long term idle afternoon itinerary. In reality, the unspoken truth is that we were stalling, convincing ourselves that waiting 6-7 hours for a possibly messy and potentially even dangerous hike would indeed be the best decision. Finally, as we were about to enter a restaurant to begin our wait, the weather app refreshed again: there would be storms all through the evening, and the thunder and lightning were not going to cease any time soon. A quick glance at each other and we already knew Tre Cime was not in the cards. We admitted defeat. But only for today. Tomorrow would be a new day. With our hiking plans demolished, we turned our sights towards the other main attraction of the region: great accommodations, and food & wine to rival any across the globe. When planning our hiking-focused trip, we had used hikes at Tre Cime di Lavaredo, Lago di Braies (Pragser Wildsee), and Seceda in Ortisei, Italy to triangulate our agenda, and help us locate a perfect hotel which would allow us to quickly reach each of our favorite sites. Our objective was to find excellent accommodations which would not only serve as a good launching pad for each hike, but also provide a tranquil and enjoyable experience after long days on our feet. But first: despite the rain out preventing us from doing the big Tre Cime hike, we were determined to still hit at least one of our planned destinations the first day. We would pass the turn for Pragser Wildsee area on our way to our hotel, so we decided to make the quick 20 minute detour over to see if we could at least catch a few views of the oft-Instagrammed Lago di Braies. The clouds looked like they were clearing ever so slightly in that direction, so we made an attempt. After all, aren’t some of the best Instagrammed photos a little moody, foggy, and sometimes rainy in all the right kind of emo ways? We had to at least try. If for no other reason than to prove to ourselves that our driving all over Italy all day chasing views and weather windows was not for naught. Fortunately, our efforts were rewarded. Our day was slightly salvaged by the fact that we were actually able to catch a weather window in which we could see the majority of the mountains around the famous lake, as well as capture a few moody rainy photos – overall, not a total loss, and enough to scratch our nature itch for the day. We considered it a win. A quick hour drive after the rain-out fiasco and the rebound at Lago di Braies, we arrived at Hotel Petrus – perfectly located and central for all of our weekend objectives. Before even entering the hotel, we were greeted on the entrance carpet by Lila, the family’s impossibly cute oversized dog. Lila the dog even has her own page on the Hotel Petrus website, which we think says all you need to know about the love and care the Petrus family has for its staff – dogs included. After a brief cuddle session with Lila (I never can resist), Petrus’ welcoming staff showed us around their property and invited us to ease our residual rain-out disappointment with a visit to their spa. The hotel’s many calming spaces soothed our rainy day blues – and provided an oasis for relaxation as we rearranged our next few days’ itinerary. Hotel Petrus is entirely charming. The Aichners manage to make it feel like an extension of their home, while providing modern, top-grade facilities in a quiet and compelling mountainside location. They treated us like family throughout our stay. It is not often that one finds a perfect fusion of luxury hotel blended with bed & breakfast familiarity, and so we found it to be quite strikingly special and unique. All year round, Hotel Petrus is extremely welcoming of not only couples like ourselves, but of families who are looking for a farm-like, mountain-themed experience. They offer hiking routes of varying difficulty, horse riding / lessons at their very own stables, and the opportunity to spend some time playing with the goats on the Petrus farm. Upon checking in, we arrived to our lodge-like room to find a selection of vegetables presented to us from that very same Petrus farm. The radishes were the spiciest we had ever tasted, and it was a perfect way to whet our appetite in advance of our dinner reservation later that evening. As we munched away, we perused the Petrus materials and checked out the backpack they make available to guests in the room, whilst taking in views of the slopes of the Kronplatz (the most modern ski area in the South Tyrol region – queue a return visit in winter!) as the weather began to cooperate (we hoped). And soon thereafter, we headed downstairs to dinner. Hotel Petrus’ restaurant was awarded a toques by Gault & Millau in 2016 and deservedly so. And here again the staff at Hotel Petrus manage to achieve that unique feel of both luxury and home. Our meal provided a sampling of the best of local South Tyrolean cuisine with the taste and presentation of an award winning restaurant. And their wine (something that has strongly attracted us to this region) did not disappoint. If you choose to partake, get the house red. We found it to be so good that we brought two bottles back home! 4am: the first alarm sounds. Dawn Patrol, indeed. We snoozed until 4:10am, and by 4:15am we were quietly exiting our room and headed for the entrance… After a brief panic and snafu at the realization we hadn’t a clue how to get our car out of the garage before regular hours (thank you to whoever answered our panicked 4:40am call and gave us instructions! ), we were off. It turned out to be a blue bird morning just as we had hoped for, and the alpine start was entirely worth it. We parked in a near empty parking lot, and set off seeing just one other person on the trail to Tre Cime and the Locatelli Refugio. We couldn’t help but stop every 30 seconds to take photos, as the light was constantly changing on the peaks as the sun rose over the horizon and spilled varying hues of orange and pink over the traditionally white and gray Dolomiti. And then the full daylight set in, and the peaks returned to their normal hues and the cows were out in volumes to start their grazing. We were a bit ambitious with the hike, veering off the intended path towards another section of the park, often walking in silence as we continued off on side trails, eager to see what was around each bend. Halfway through the hike, one reaches the Rifugio Locatelli high up in the mountains. We arrived just as the climbers who had stayed overnight were emerging from their rooms, gulping down coffee by the buckets, and heading out to start their own days’ aspirational hikes and climbs. 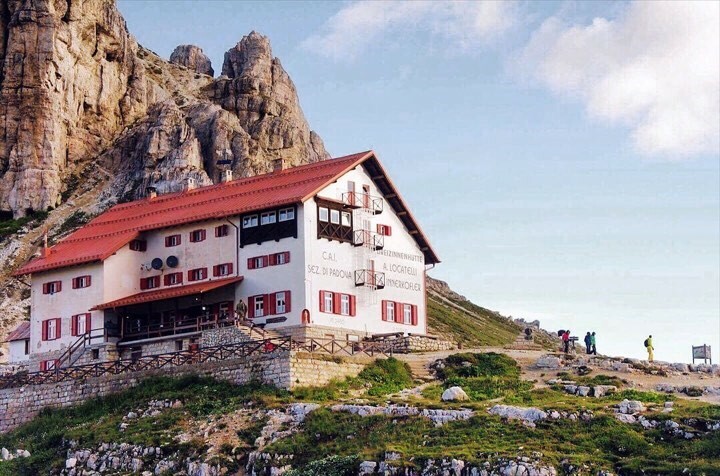 We highly recommend a stopover at the Rifugio for a truly unique experience in sharing in mountain and climbing culture at its finest. No frills (or WiFi) are needed up there and it’s not hard to appreciate the simplicity of it all. Being mountain lovers ourselves, it was a stark reminder of how little we need to be truly happy: a cup of joe, an incredible adventure, and good people to share it with is really all that’s necessary. Upon returning to Hotel Petrus, we did not need to say more than 3 words before the staff knew exactly what we needed after an early morning of mountain adventuring. We had missed breakfast in our quest to see as much as possible while in the Dolomites, so our bellies were aching for something nutritious and delicious upon our late return to the hotel. Within minutes, we were seated outside in the garden with the very best local cheeses and meats (speck is the local specialty) and a couple of beers - perfection. Stomachs pleased and feeling rejuvinated, we packed up our stuff and headed out of the region, in a state of absolute bliss and with happy hearts. Our stay at Hotel Petrus as well as the accompanying Tre Cime views had us feeling full of everything South Tyrol had to offer, and left us with only one remaining desire: to come back as soon as possible.